For the second year in succession the GAA face having to schedule inter-county games during their designated April club month. 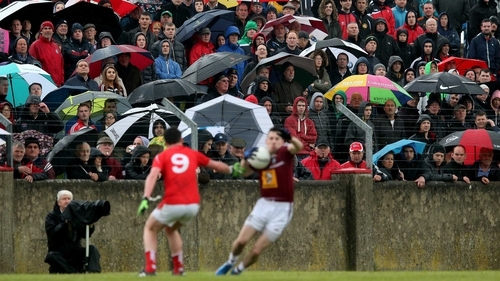 Croke Park are hoping to avoid this by scheduling four games on Sunday in Allianz Football League Division 3. If results go their way they will be able to keep April clear. But with the meeting of Westmeath and Louth postponed last weekend there is still a chance that the Division 3 final will have to be pushed back by a week and into next month. If Down get a result against Louth, a win or a draw will do, Laois beat Carlow and Westmeath lose to Longford the final can go ahead as planned on Saturday, 30 March. There are several other scenarios where the top two could be decided on Sunday, though this is the most straight-forward. But if either or both of Louth and Westmeath win this weekend they are in with a chance of making the top two and the Division 3 final, which will then have to be delayed. Their game was originally scheduled for last Saturday before falling victim to the weather. The same thing happened Clare-Meath in Division 2 and this was played on Sunday in Ennis 24 hours later than originally planned. The Lake County and the Wee County were unable to play on Sunday or the bank holiday Monday for a number of reasons. Both counties have members of An Garda Siochana on their panels who were required for St Patrick’s Day duties on Sunday while Louth have players who work in Northern Ireland, where Monday wasn’t a bank holiday. If their game has to be played it will go ahead on the weekend of 30 March with the final the first weekend in April. In 2018 there were a number of back matches in Division 4, all of which were delayed due to bad weather making pitches unplayable, that weren’t played to avoid running into April. But the Division 1 hurling final, where Kilkenny beat Tipperary, had to be played on 8 April last year due to weather-enforced delays. The Cats’ semi-final with Wexford was on 1 April. The GAA rolled out a revamped inter-county calendar last year with the months of April and September set aside for club games only. However, they weren’t able to achieve this due to the delay in the hurling league semi-final and final and the fact that the All-Ireland football decider had to be pushed into the first week in September due to the Pope’s visit to the country in August. The GAA also try to play the last round of League games at the same time so no team has the advantage of knowing exactly what they have to do in order to make a final or avoid relegation. The final round of this year’s Division 4 regular season is split over two days this weekend, Saturday and Sunday, as Derry and Leitrim have already qualified for the final and there is no relegation. There remains a chance that the GAA will play the Division 1 hurling final, which has been pushed back by a week until Sunday, 31 March due to weather delays, at Croke Park for the first time since 2011. The small ball showpiece is normally in Semple Stadium, Thurles, but if the Division 3 football final is put back the hurling could be staged as part of a double-header with the Division 1 football final. The Division 2 and Division 4 finals would then double-up at GAA Headquarters on the Saturday evening. Meanwhile, the GAA have confirmed that the Division 1 hurling semi-finals will both take place at Nowlan Park, Kilkenny on Sunday. First up is the meeting of Dublin and All-Ireland champions Limerick with a 1.0pm throw-in followed by Galway-Waterford at 3.30pm. Extra-time will be played in these games if required and there will be a winner on the day.